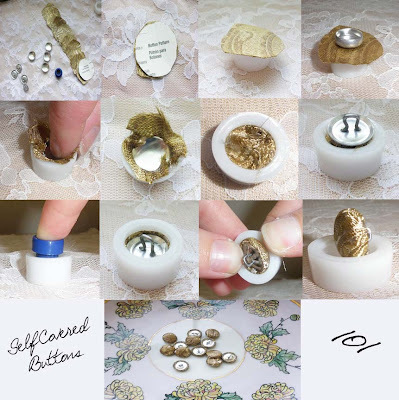 Step by Step self covered buttons from a kit bought at JoAnns (for the Duke's waistcoat)...The instructions are on the back of the package but I've never done a how to and thought I would practice lol!!! 2. Cut out pattern provided on the back of the button kit package. Cut enough Fabric circles as you need buttons. 3. Place Fabric on the Base provided. Try to center as best as possible, otherwise the fabric might be too short on one side and it comes out of the casing later. 7. Place Button Back on top of Base covering the Fabric and Button Head. 9. You hear a slight snap and feel the Button Back pop into place. At this point the Button Back is completely emerged into the Base along with the Button Head and Fabric. Wow! Those came out great, and the pictures did too! I didn't realize how much work went into those. You're so smart!